No one can deny the beauty of a perfectly cut diamond, void of any imperfections or flaws, both internally and in surface structure. The first thing someone looks at when purchasing a diamond is its ability to sparkle. The whole sparkling phenomena is a result of the diamond’s natural response to light, and it is expressed in three primary ways. First, light passes through the diamond itself, and then the diamond reflects a portion of light back, and finally refracts another portion of the same light in itself. All of this makes up a process of dispersion and refraction, the result being a sparkle. In order for this dance of light to occur in a diamond, the light must be unobstructed and undiverted in its journey through the gemstone. 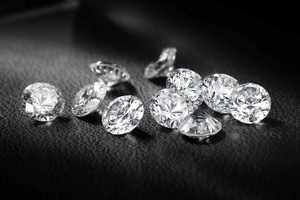 Obstructions or flaws in a diamond, depending on the size and exact type of the said obstruction, will cause a diamond to carry a sort of lifelessness with it, and will only express itself in a dull manner, completely missing the sought after unique diamond experience that a buyer is looking for. Inclusions, which are the internal flaws that can be found in a diamond, usually come about during the formative years of a diamond. They are essentially like birthmarks, and are due to irregular crystallization during the creation process. Blemishes on the other hand, which are external flaws on the surface of a diamond can be caused by cutting and polishing, or even man-made during mining. Inclusions are quite normal to find in a diamond and should not be a huge cause for concern so long as they are properly treated. If the flaws are very small and have little to no effect on the clarity of the diamond, they might be even be entirely ignored. In some cases people may even view a diamond’s inclusions as unique “fingerprints” that add to the interest level of the gemstone. Inclusions are usually documented in a diamond’s gradation report. Unless a diamond has certain flaws that interrupt its reputation as being a diamond, inclusions are considered to be unique identifying characteristics of a particular diamond. If the inclusions or flaws are too dense they will usually be treated. So how exactly can inclusions potentially harm a diamond’s value? For one, as mentioned before a diamond’s brilliance level will be lower if it cannot properly transmit and scatter light that is passing through itself. This combined with large inclusions or color problems can really hurt a diamond’s overall beauty. Another important factor that comes into play is durability. Inclusions in the structure of a diamond cause the gemstone to be more vulnerable to fractures. It really depends on the size of the inclusions, but generally it is safe to assume that the diamond will have a weaker structure if it is heavily flawed. For informative purposes it is important to understand the industry terms that refer to specific types of flaws in a diamond. The most notorious of flaws tends to be the “feathers.” Feathers refer to fissures within a diamond’s internal structure; Hairline cracks that tend to look like feathers. The smaller feathers tend to be quite harmless and will usually not damage a diamond’s structural stability so long as they do not rise to the surface of the gemstone. So how do you spot them? Depending on how you are viewing them, feathers can appear transparent, glossy, or even shiny and white. Any rigorous cleaning or handling of a diamond with feathers can quickly become an issue, as they tend to get larger. Next we have “Knots” which is mostly trouble with the person fashioning the diamond. They are essentially an additional diamond crystalline structure that rises to the surface while being cut and polished. They tend to be easily visible under the proper lighting circumstances and magnification. Knots have most of their effect on the clarity of a diamond. Finally the last most common flaw would be the cavity. Cavities are simply holes in the actual surface of the diamond. Cavities can turn dark over time if they accumulate any foreign material, which can make them look quite ugly on the surface of the diamond.